An edge-weighted graph is a graph where we associate weights or costs with each edge. A minimum spanning tree (MST) of an edge-weighted graph is a spanning tree whose weight (the sum of the weights of its edges) is no larger than the weight of any other spanning tree. The graph is connected. The spanning-tree condition in our definition implies that the graph must be connected for an MST to exist. 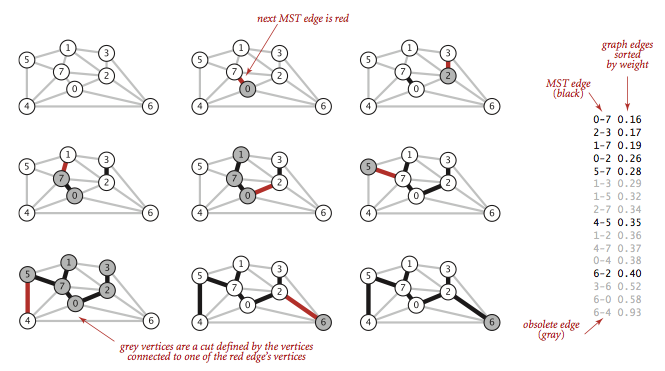 If a graph is not connected, we can adapt our algorithms to compute the MSTs of each of its connected components, collectively known as a minimum spanning forest. The edge weights are not necessarily distances. Geometric intuition is sometimes beneficial, but the edge weights can be arbitrary. The edge weights may be zero or negative. If the edge weights are all positive, it suffices to define the MST as the subgraph with minimal total weight that connects all the vertices. The edge weights are all different. If edges can have equal weights, the minimum spanning tree may not be unique. Making this assumption simplifies some of our proofs, but all of our our algorithms work properly even in the presence of equal weights. Adding an edge that connects two vertices in a tree creates a unique cycle. Removing an edge from a tree breaks it into two separate subtrees. A cut of a graph is a partition of its vertices into two disjoint sets. A crossing edge is an edge that connects a vertex in one set with a vertex in the other. We recall For simplicity, we assume all edge weights are distinct. Under this assumption, the MST is unique. Define cut and cycle. The following properties lead to a number of MST algorithms. Given any cut in an edge-weighted graph (with all edge weights distinct), the crossing edge of minimum weight is in the MST of the graph. 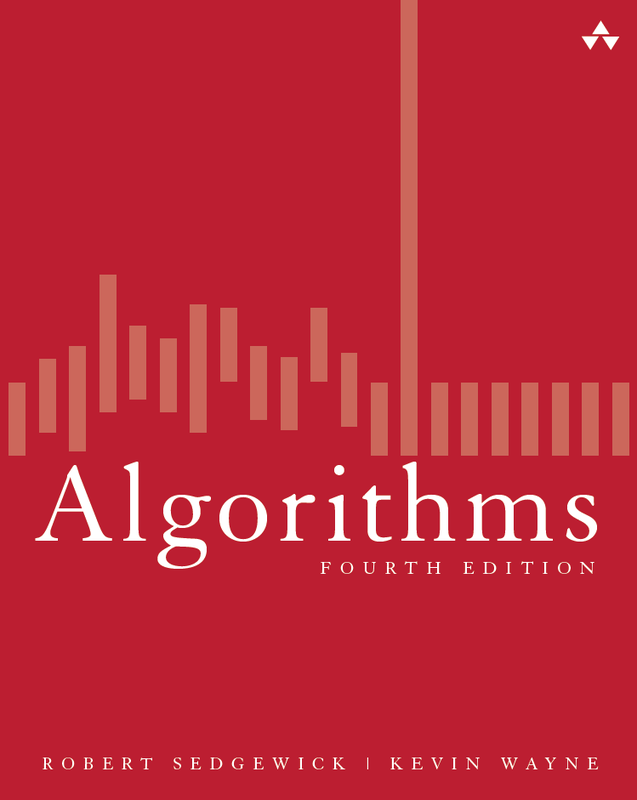 The cut property is the basis for the algorithms that we consider for the MST problem. Specifically, they are special cases of the greedy algorithm. The following method colors black all edges in the the MST of any connected edge-weighted graph with V vertices: Starting with all edges colored gray, find a cut with no black edges, color its minimum-weight edge black, and continue until V-1 edges have been colored black. The either() and other() methods are useful for accessing the edge's vertices; the compareTo() method compares edges by weight. Edge.java is a straightforward implementation. We allow parallel edges and self-loops. EdgeWeightedGraph.java implements the API using the adjacency-lists representation. Prim's algorithm works by attaching a new edge to a single growing tree at each step: Start with any vertex as a single-vertex tree; then add V-1 edges to it, always taking next (coloring black) the minimum-weight edge that connects a vertex on the tree to a vertex not yet on the tree (a crossing edge for the cut defined by tree vertices). The one-sentence description of Prim's algorithm leaves unanswered a key question: How do we (efficiently) find the crossing edge of minimal weight? Lazy implementation. We use a priority queue to hold the crossing edges and find one of minimal weight. Each time that we add an edge to the tree, we also add a vertex to the tree. To maintain the set of crossing edges, we need to add to the priority queue all edges from that vertex to any non-tree vertex. But we must do more: any edge connecting the vertex just added to a tree vertex that is already on the priority queue now becomes ineligible (it is no longer a crossing edge because it connects two tree vertices). The lazy implementation leaves such edges on the priority queue, deferring the ineligibility test to when we remove them. LazyPrimMST.java is an implementation of this lazy approach. It relies on the MinPQ.java priority queue. Eager implementation. To improve the lazy implementation of Prim's algorithm, we might try to delete ineligible edges from the priority queue, so that the priority queue contains only the crossing edges. But we can eliminate even more edges. The key is to note that our only interest is in the minimal edge from each non-tree vertex to a tree vertex. When we add a vertex v to the tree, the only possible change with respect to each non-tree vertex w is that adding v brings w closer than before to the tree. In short, we do not need to keep on the priority queue all of the edges from w to vertices tree—we just need to keep track of the minimum-weight edge and check whether the addition of v to the tree necessitates that we update that minimum (because of an edge v-w that has lower weight), which we can do as we process each edge in s adjacency list. In other words, we maintain on the priority queue just one edge for each non-tree vertex: the shortest edge that connects it to the tree. PrimMST.java is an implementation of this eager approach. It relies on the IndexMinPQ.java indexed priority queue to perform the decrease-key operation. 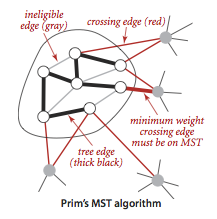 Prim's algorithm computes the MST of any connected edge-weighted graph. The lazy version of Prim's algorithm uses space proportional to E and time proportional to E log E (in the worst case) to compute the MST of a connected edge-weighted graph with E edges and V vertices; the eager version uses space proportional to V and time proportional to E log V (in the worst case). Kruskal's algorithm processes the edges in order of their weight values (smallest to largest), taking for the MST (coloring black) each edge that does not form a cycle with edges previously added, stopping after adding V-1 edges. The black edges form a forest of trees that evolves gradually into a single tree, the MST. To implement Kruskal's algorithm, we use a priority queue to consider the edges in order by weight, a union-find data structure to identify those that cause cycles, and a queue to collect the MST edges. Program KruskalMST.java implements Kruskal's algorithm along these lines. It uses the helper MinPQ.java, UF.java, and Queue.java data types. Kruskal's algorithm computes the MST of any connected edge-weighted graph with E edges and V vertices using extra space proportional to E and time proportional to E log E (in the worst case). Prove that you can rescale the weights by adding a positive constant to all of them or by multiplying them all by a positive constant without affecting the MST. Solution. Kruskal's algorithm accesses the edge weights only through the compareTo() method. Adding a positive constant to each weight (or multiplying by a positive constant) won't change the result of the compareTo() method. 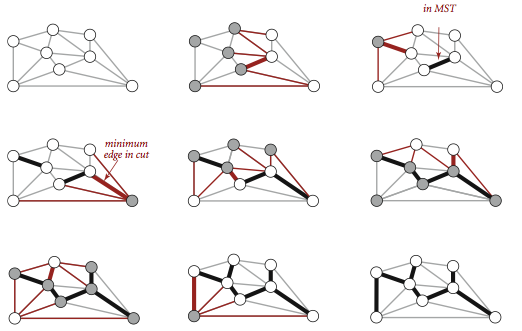 Show that if a graph's edges all have distinct weights, the MST is unique. Solution. For the sake of contradiction, suppose there are two different MSTs of G, say T1 and T2. Let e = v-w be the min weight edge of G that is in one of T1 or T2, but not both. Let's suppose e is in T1. Adding e to T2 creates a cycle C. There is at least one edge, say f, in C that is not in T1 (otherwise T1 would be cyclic). By our choice of e, w(e) ≤ w(f). Since all of the edge weights are distinct, w(e) < w(f). Now, replacing f with e in T2 yields a new spanning tree with weight less than that of T2 (contradicting the minimality of T2). How would you find a maximum spanning tree of an edge-weighted graph? Solution. Negative the weight of each edge (or reverse the sense of comparison in the compareTo() method). Implement the constructor for EdgeWeightedGraph.java that reads an edge-weighted graph from an input stream. Determine the amount of memory used by EdgeWeightedGraph.java to represent a graph with V vertices and E edges, using the memory-cost model of Section 1.4. Solution. 56 + 40V + 112E. MemoryOfEdgeWeightedGraph.java computes it empirically assuming that no Integer values are cached—Java typically caches the integers -128 to 127. Given an MST for an edge-weighted graph G, suppose that an edge in G that does not disconnect G is deleted. Describe how to find an MST of the new graph in time proportional to E.
Solution. If the edge in not in the MST, then the old MST is an MST of the updated graph. Otherwise, deleting the edge from the MST leaves two connected components. Add the minimum weight edge with one vertex in each component. Given an MST for an edge-weighted graph G and a new edge e, describe how to find an MST of the new graph in time proportional to V.
Solution. Add edge e to the MST creates a unique cycle. Delete the maximum weight edge on this cycle. Suppose that you implement an eager version of Prim's algorithm but instead of using a priority queue to find the next vertex to add to the tree, you scan through all V entries in the distTo array to find the non-tree vertex with the smallest value. What would be the order of growth of the worst-case running time for the eager version of Prim's algorithm on graphs with V vertices and E edges? When would this method be appropriate, if ever? Defend your answer. Solution. Prim's algorithm would run in time proportional to V^2, which is optimal for dense graphs. Provide an implementation of edges() for PrimMST.java. Minimum spanning forest. Develop versions of Prim's and Kruskal's algorithms that compute the minimum spanning forest of an edge-weighted graph that is not necessarily connected. Solution. PrimMST.java and KruskalMST.java accomplish this. Certification. Write a method check() that uses the following cut optimality conditions to verify that a proposed set of edges is in fact an MST: A set of edges is an MST if it is a spanning tree and every edge is a minimum-weight edge in the cut defined by removing that edge from the tree. What is the order of growth of the running time of your method? Boruvka's algorithm. Develop an implementation BoruvkaMST.java of Boruvka's algorithm: Build an MST by adding edges to a growing forest of trees, as in Kruskal's algorithm, but in stages. At each stage, find the minimum-weight edge that connects each tree to a different one, then add all such edges to the MST. Assume that the edge weights are all different, to avoid cycles. Hint: Maintain in a vertex-indexed array to identify the edge that connects each component to its nearest neighbor, and use the union-find data structure. Remark. There are a most log V phases since number of trees decreases by at least a factor of 2 in each phase. Attractive because it is efficient and can be run in parallel. Minimum bottleneck spanning tree. A minimum bottleneck spanning tree of an edge-weighted graph G is a spanning tree of G such that minimizes the maximum weight of any edge in the spanning tree. 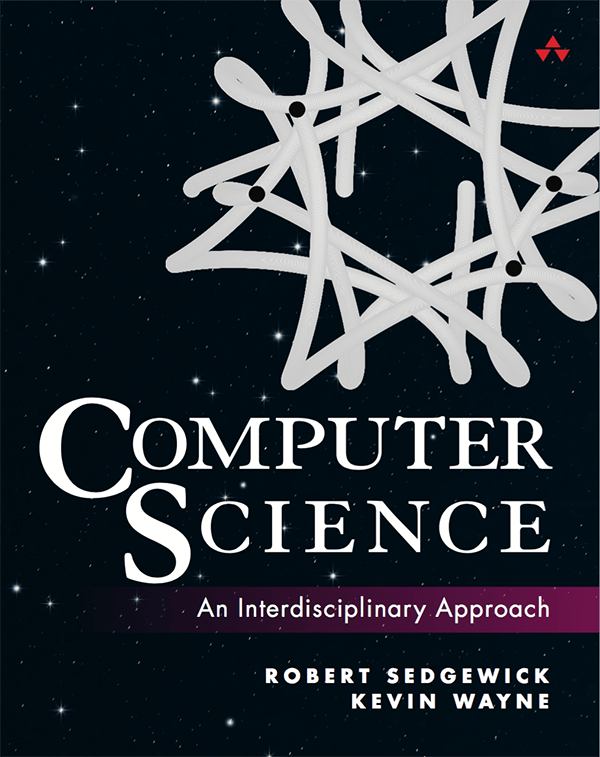 Design an algorithm to find a minimum bottleneck spanning tree. Solution. Every MST is a minimum bottleneck spanning tree (but not necessarily the converse). This can be proved using the cut property. Minimum median spanning tree. A minimum median spanning tree of an edge-weighted graph G is a spanning tree of G such that minimizes the median of its weights. 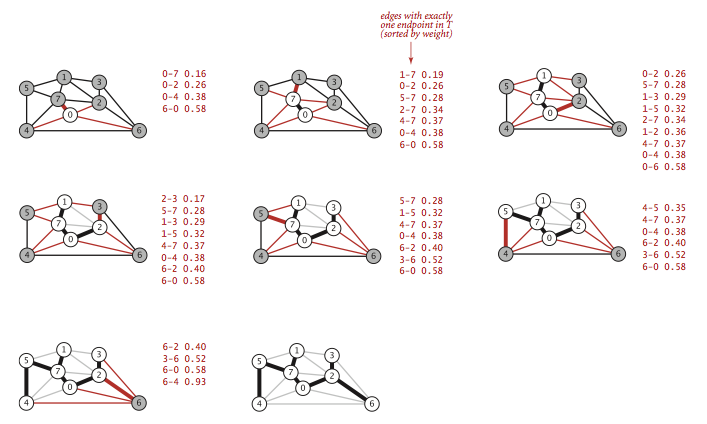 Design an efficient algorithm to find a minimum median spanning tree. Solution. Every MST is a minimum median spanning tree (but not necessarily the converse). Maze generation. Create a maze using a randomized version of Kruskal or Prim's algorithm. Unique MST. 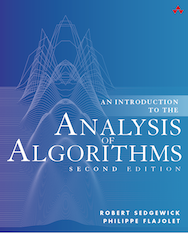 Design an algorithm to determine if the MST is unique for a given graph G.
Random spanning tree. Given a graph G, generate a spanning tree of G, uniformly at random. Using the following remarkable theorem of Aldous and Broder: Start at an arbitrary vertex s and take a random walk until every vertex has been visited (choosing an outgoing edge uniformly at random among all incident edges). If a vertex has never been visited before, add the edge to that vertex to the spanning tree T. Then T is a uniformly random spanning tree of G. The expected running time is bounded by the cover time of G, which is at most proportional to EV. Minimum-weight feedback edge set. A feedback edge set of a graph is a subset of edges that contains at least one edge from every cycle in the graph. If the edges of a feedback edge set are removed, the resulting graph will be acyclic. Design an efficient algorithm to find a feedback edge set of minimum weight in an edge-weighted graph with positive edge weights. Distribution of edge weights in two MSTs. Suppose than an edge-weighted digraph has two MSTs T1 and T2. Prove that if T1 has k edges of weight w, then T2 has k edges of weight w. Solution. : Create an edge-weighted graph with N+1 vertices (one for each house plus a source vertex x). Include an edge between every pair of vertices i and j with cost c[i][j] (to represent the potential pipes). Include an edge between the source s and every house i with cost w[i] (to represent the potential open wells). 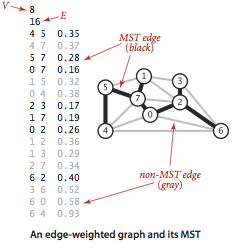 Find an MST in this edge-weighted graph. Spanning tree with exactly k orange edges. 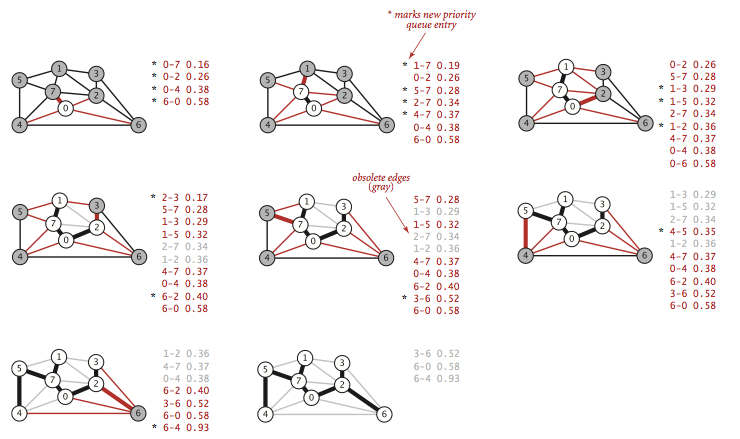 Given a graph with edges colored either orange or black, design a linearithmic algorithm to find a spanning tree that contains exactly k orange edges (or report that no such spanning tree exists). Minimum variance spanning tree. 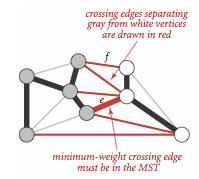 Given a connected edge weighted graph, find a minimum spanning tree that minimizes the variance of its edge weights. Last modified on February 23, 2018.